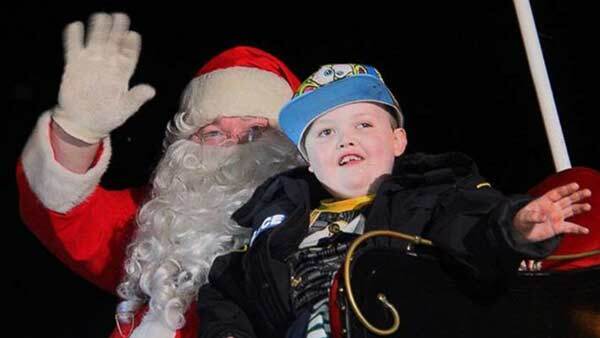 ST. GEORGE, Ontario -- A small town in Ontario recently rallied together to plan an early Christmas for a boy with brain cancer and this past Saturday the celebration proved to be a holiday to remember, complete with a parade, floats and Santa Claus, ABC News reports. Evan Leversage, 7, was diagnosed with brain cancer five years ago and in September doctors told his family to celebrate the holidays early because his time may be limited. His relative Shelly Wellwood started planning a small Christmas celebration, but it quickly became widespread thanks to a post on Facebook. Over 7,000 people showed up for the parade in St. George on Saturday, according to Evan's relative Jennifer Jablecki. "The town was just buzzing with joy and excitement," Brandy King, owner of La Petit Fleur flower shop in St. George, said. "Lights were lit, carolers were singing and there even sweet girls outside my shop playing the violin for Evan." Read the full story and see more photos on ABCNews.com.